Today, for the first Poetry Friday of the new year, an original sonnet about my cat. It's the first group project of the new year with my lovely poetry sisters. Maybe it's NOT a flock of lies. I mean, a cat can dream, right? Kismet will have you know that she is a LADY HUNTRESS, thankyouverymuch. I can't even tell you how much I love a tiny, bat-eared, calico fuzzball. I think the entire poem pivots beautifully on that image... of cough, the mighty huntress. Ahem. Re: Maybe it's NOT a flock of lies. I mean, a cat can dream, right? She really is adorable. And she gets quite chatty and switch-tailed about birds and squirrels and such. She had the biggest ears when I found her. TOE-BEANS!!!! This poem is full of perfect word-images -- I just love it, Kelly. Dare I say this poem is purrfect? I love it - and I want to come over and cuddle your cat! 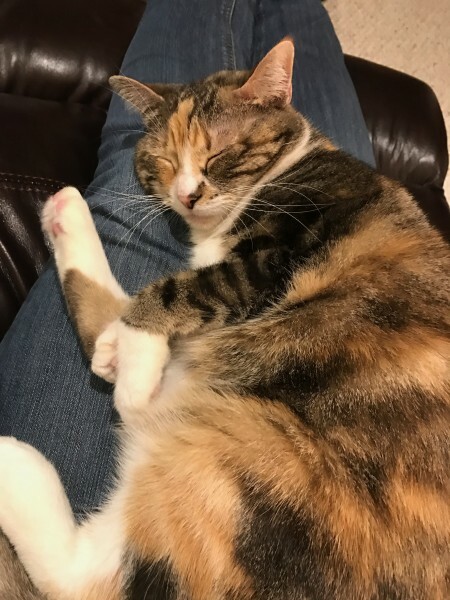 Kismet would be happy to have another lap to choose from! Yes! Toe-beans!! And "a flock of lies!" This poem is as playful as your kitty. Lovely way to use a sonnet's rhythms to take us from silent watching to imagined leaping back into contented sleep again. Ahhhhhh. It's a weird sort of love poem to my kitty. I haven't had a cat in a few years and your description makes me wish for one on my lap, dreaming of birds. It's a lovely picture you've given us, Kelly! Happy New Year! Cats are such good company. My husband had never had one in his life until he met me, and he held one of those basic biases (cats are stand-offish, dogs are better, etc.). Now he's quite converted. Happy new year to you, Linda! Kelly, as I write this my orange "fuzzball" is licking my hand, maybe to add his approval of your sonnet. I love the "pink toe-beans" and the idea of your kitty dreaming of birds while she naps in your lap. Sonnets are such a challenge, but you've made yours look effortless. Well done! Thanks for the kind words, and please give your orange boy an extra scritch from me. First, Kismet is an awesome name for a cat. Second, I love the descriptions of the birds and your story of Kismet. Honestly, I love it all. Kismet was named after being found along the side of a busy street, trying to get herself hit as a smallish kitten. (My prior cat had been put down a few months prior, my big old Katie dog was put down a couple weeks before, and I was temporarily pet-less.) She was meant to be - hence her name. us knowing that is all a flock of lies." We had a calico kitty when I was growing up, named, unimaginatively enough, Calico. She was a sweetie, but fierce when outdoors. She really would catch at least some of them! Your affection for your sweet kitty just purrs out of every line! Our neighbors had a calico named Patches, so . . .
And yes, I love my kitty. Awww...what a sweet kitty and a lovely poem. I love that line about it being a flock of lies--but a cat can dream! She loves to watch them out the windows. And she definitely dreams of hunting now and then, based on her twitches and such! I'm in awe. Your sonnet is so conversational, you make it seem so effortless! And toe-beans! Perfection!! Thanks, Mary Lee. I really think that enjambment and not getting TOO fussy with the iambs is all it takes. Ah to pen a sonnet with "pink toe-beans" a true exchange of affection, lovely, thanks! Thank you for leaving such a lovely comment!